DARA-I MAZOR, NURGAL, KUNAR, AFGHANISTAN — It is only a short drive into a side valley just off the busy main road between Jalalabad and Asadabad, the capitals of Afghanistan’s eastern provinces of Nangarhar and Kunar. The narrow dusty road passes fields of golden blades of wheat that slightly sway in the light breeze. Beyond the fields and the scattered verdant trees, barren craggy hills frame the valley called Dara-i Mazor in Kunar’s district of Nurgal. Across the small river, some of the traditional mud houses resemble tiny bulky castles, hinting at the fact that Afghanistan’s violent past dates much further back than the U.S. or Soviet-led invasions. Behind a low farm house that lies quietly in the shadows of surrounding trees, there is yet another wheat field. But next to it several patches of land are covered in other plants whose single green stems topped by golf-ball sized pods rise above the bushy leaves at their roots. It is opium-yielding poppy. Opium has an analgesic effect and is the base for morphine, heroin, and other opioids that are used for medical purposes, but also for illegal drug consumption. 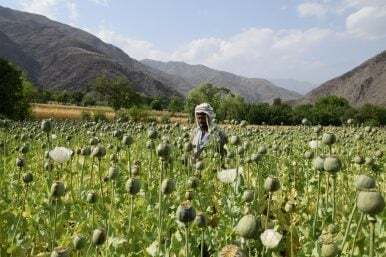 Afghanistan accounts for some 70 percent of the global opium production, according to the World Drug Report 2016 of the United Nations Office on Drugs and Crime (UNODC). Although poppy cultivation is concentrated in southern Afghanistan, it can be found throughout the country. 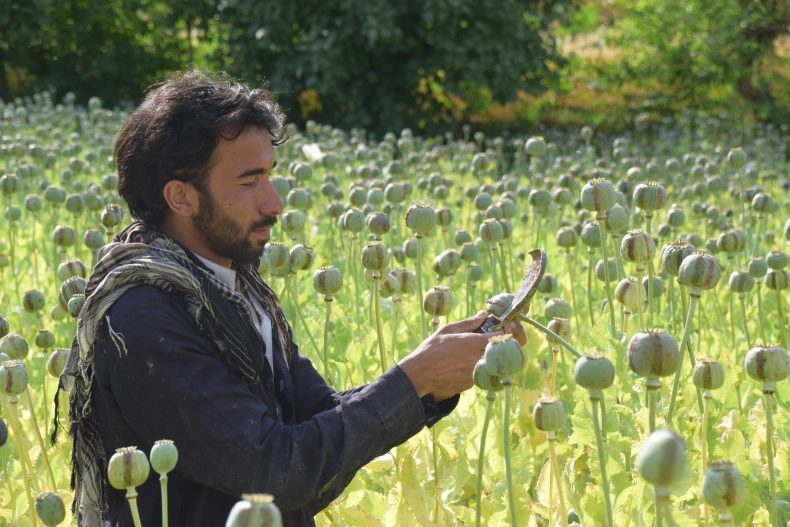 And while opium production is more prevalent in ungoverned areas like Dara-i Mazor, it also exists in government-controlled zones, as security forces, often struggling to keep insurgents at bay, are hardly able to prevent poppy cultivation. In Kunar, early May was the end of the short harvest season, which takes places right after the white or dark pink poppy flowers have withered and only the green capsules remain. This can be earlier or later in other regions of the country, depending on the local conditions. The harvest itself is a labor-intensive task. Every single poppy pod has to be lanced with a tool with several tiny blades at its end. Once lanced, the opium latex immediately leaks out of the razor-thin scratches (in Dara-i Mazor the sap is a light pink, but experts say that it is usually white at first before it oxidates in the air, quickly turning to a pink and later dark brown color). The valuable latex is just liquid enough to drip out, but still gooey enough to stick to the pod and to not drop to the ground. Normally, the capsules are then left until the next day. However, given my short visit, the locals showed me right away how they skim the leaked-out opium from the pod with another tool that looks like a broad sickle. One farmer, a young man with a neatly trimmed beard and pitch black, greasy hair, stated that about 60 percent of his fields are poppy. And this is not an exception. Asked for his reason to plant poppy, he said that he is forced to do it because other crops would yield little profit. This was also asserted by other farmers in Nurgal and Shigal, another district of Kunar. However, they don’t claim that other crops would yield no profit, raising the question of whether they are only engaging in poppy cultivation for the higher profits that no licit crop can possibly generate. But according to Dr. David Mansfield, a senior researcher for the London School of Economics and the Afghan Research & Evaluation Unit who has worked on opium poppy cultivation in Afghanistan for almost two decades, profit-maximization is not the driving force behind the decision. Afghan farmers would rather try to balance their livelihoods, secure a certain degree of food self-sufficiency, use their soil sustainably (which also means changing or rotating different crops), and mitigate risks of crop failures. Thus, the monetary profit is only one of many factors in the farmers’ decisions. 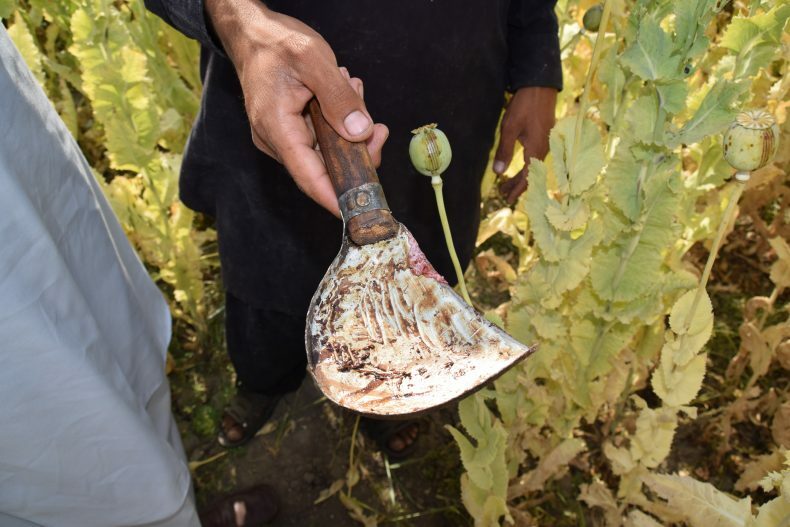 Hence, the often-portrayed image that insurgents or mafia-like groups exploit the farmers’ weaknesses, forcing them to cultivate opium, does not match the reality. The decision to sow poppy is rather – sometimes more, sometimes less – freely taken by the farmers themselves. 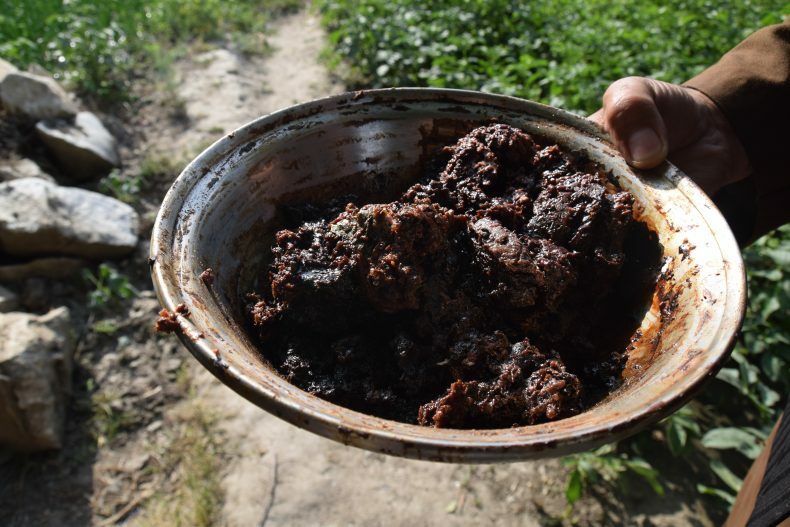 In the subsequent sale of raw opium the farmers are far from being at the mercy of a cartel. Farmers in Nurgal and Shigal stated that numerous merchants come separately to the farms to buy opium and that they would usually only buy a very few kilograms – which is, even for a small farmer, only a fraction of his whole yield (according to the UNODC Afghanistan Opium Survey, in 2016 “the average opium yield amounted to 23.8 kilograms per hectare”). This makes opium even more attractive for farmers, as – contrary to other crops – they don’t have to transport their harvest over often underdeveloped and sometimes dangerous roads to a market. Asked about the merchants, farmers described them as independent actors that try to make a profit by reselling the narcotic for a higher price, but assert that they do not belong to any specific group or cartel. This was confirmed by an opium trafficker who asked to not be identified. It was also confirmed by two experts, who added that – while there are certain regional differences – the sale of small portions of the opium yield to several independent merchants is the norm across Afghanistan. This does not exclude the involvement of some larger, more powerful dealers or even criminal networks. But they don’t control the market and are just some among many actors. In this regard, the opium trafficker even asserted that bigger networks would usually only play a larger role once the raw opium is processed to heroin. This is, however, further down the chain and does not affect the farmers directly. Given the above, the fluctuating price of opium at the farm-gate is not unfairly dictated by the buyers, but set according to various conditions of a rather free market. And even though it is a fraction of heroin prices on the end markets, it is still a small fortune by Afghan standards. UNODC put the average price of one kilogram of dry opium at the farm-gate in eastern Afghanistan in 2016 at $239. Farmers in Nurgal and Shigal as well as the opium trafficker claimed to sell dry opium even for 25,000 to 35,000 Pakistani rupees (about $240 to $335) per kilogram (the indication of Pakistani rupee is not out of the ordinary, as in parts of eastern Afghanistan, Pakistani rather than Afghan currency is the norm). Such prices are hard to verify though and might be flawed. Moreover, setting this into perspective is difficult. Compared to the monthly salary of an average Afghan worker in the capital Kabul, which amounts to around $200, opium sales prices appear very high. However, it has to be taken into account that those prices are qualified by significant production costs and that the farmers live in a different socioeconomic setting. Be that as it may, farmers sometimes even hold back raw opium, which does not spoil, in order to wait for better sales prices — yet another sign of a free market. In view of all this and contrary to common perception, the opium sale at the Afghan farm-gate is not in the iron grip of the Taliban or powerful cartels, but rather a loose open market in which numerous independent farmers and racketeers try to get their share of this profitable illicit trade. This article has been originally published in Swedish by Blankspot.